SUNBEAM, Idaho -- Driving along the Yankee Fork of the Salmon River you see two worlds. One is a pristine wild land with tall trees and mountain goats scampering along ridge lines. But a quick glance in another direction reveals dredge tailings, a straight-channel riverbed, preserved ghost towns showing the area's mining history and a massive 988-ton dredge rusting in a pool of cloudy blue water. Billy Reed, a volunteer with the Yankee Fork Gold Dredge Association, said the dredge brought 35 temporary jobs to the area during the five-month period when the dredge was constructed. During operation, the outfit employed 15 men, he said. The economic impact on the area was not significant, Reed said. The operation extracted an estimated 35,821 ounces of gold, worth an estimated $1.2 million at the time, along with $14,000 worth of silver. But in its wake it left an environmental disaster and devastated critical fish habitat that existed well before man ever set foot on the continent. The damage never can be fully undone. "(The dredge) just turned the valley bottom upside down," said Matt Green, Trout Unlimited project manager for the upper Salmon area. The river once was a haven for anadromous fish. Today it's a spawning ground to a fraction of the salmon and steelhead that historically made the arduous journey upstream to further their lineage. The Yankee Fork is an example of man's effect on salmon, but also illustrates the juxtaposition of ideas on how to bring the fish back. Greg Stahl, of Idaho Rivers United, said salmon are part of Idaho's identity. Because of their anadromous nature, they are only native to northern states with tributaries leading to the Atlantic and Pacific oceans. In addition to preserving part of Idaho's heritage, Stahl a healthy salmon population means hundreds of millions per year in tourism dollars from anglers and those wanting to watch salmon spawn. In addition, salmon fishing is tradition for Idaho's Indian tribes and provides food for various wildlife species. The dredge ran intermittently for five years between 1940 and 1952. Not only did it straighten the river, ridding it of pools, eddies, boulders and shade from fallen trees, it also moved the entire riverbed -- separating it from the floodplain. In 2008, Trout Unlimited decided to work on restoring the river's habitat for salmon and steelhead. The first project got underway in 2012. Initially, Green said, many labeled the restoration a fool's errand. The river was so far from what it had been historically. Upon completing that first project, however, Trout Unlimited's work gained momentum. "We just try and recreate as many natural processes as we can," Green said. He likened the work to creating hotel rooms for the fish passing through, allowing them to gain strength for their journey to the ocean. Trout Unlimited has worked on four projects -- completing three -- restoring more than four miles of habitat. The group has many partners, and gets most of its funding for the restoration work from the Bonneville Power Administration, Shoshone-Bannock Tribes, Bureau of Reclamation and Pacific Coast Salmon Recovery Funds. This year, Trout Unlimited will spearhead the largest project on the Yankee Fork to date, restoring the main stem channel closer to its original location, where it can rejoin the floodplain. "When you have these big mountains of dredge tailings, it really confines the river and kind of turns it into a canal," Green said. While Trout Unlimited has been aggressive, it is limited in its abilities. Some of the dredge tailings are considered "pristine" and of historical significance. The bulk of the untouched tailings are protected and cannot be disturbed by restoration projects. But the loss of habitat on the Yankee Fork wasn't the only obstacle to salmon returning here to spawn. From the 1950s to the 1970s, four dams -- Ice Harbor, Lower Monumental, Little Goose and Lower Granite -- were constructed on the Snake River. Bruce Mulkey, a 69-year-old rancher and self-proclaimed anti-environmentalist, has lived on the same piece of land south east of Salmon his entire life. He remembers a different time, when salmon flushed through the basin. Sandy Creek runs for 1.5 miles through his land and into the Lemhi River. When he was a child, he remembers seeing salmon spawning in the 15-foot-wide creek, but said it's been decades since they have returned. Mulkey recalled watching the landscape change in the '70s, when salmon fishing seasons on the local rivers dried up. "The whole system just about crashed then," he said. "It was about the same time they finished the last dam on the Snake River." Mulkey said the Idaho Department of Fish and Game put around 30 steelhead hatch boxes in Sandy Creek one year. The juveniles that emerged from the boxes might now be considered historic. "I never saw one fish in there after that," Mulkey said. While Mulkey doesn't support dam breaching, because he fears it would spike his power rates, he knows the dams are the cause of the fish disappearing. He would like to see them return, but isn't sure how that will happen. While he's noticed a lot of restoration work being done around his property, he's not impressed with the results. "There has been a hell of a lot of money in this so-called salmon recovery, and I don't know if they are getting a great return on their investment," Mulkey said. Snake River sockeye, spring/summer and fall chinook and steelhead, all are listed under the Endangered Species Act. Operators of the lower Snake dams -- Bonneville Power, U.S. Army Corps of Engineers and Bureau of Reclamation -- must pay for mitigation efforts to offset the fish the dams kill. Breaching advocates, however, believe those mitigation efforts aren't close to adequate. Mark Davidson, director of Trout Unlimited's Idaho Water Project, said the group decided its best option was to partner with landowners and the agricultural community, rather than fight legal battles. According to the federal government's biological opinion, anadromous fish can be recovered while keeping four dams on the lower Snake River west of Lewiston. Those dams have become the focus of the fight to save the fish. Breaching the four dams eventually would restore a 140-mile stretch of river to its natural, free-flowing form. However, it would require authorization from Congress and appropriation of the funds for the project. A 2007 report from Bonneville Power estimated the effects of breaching would cost between $230 million and $471 million annually in lost power-generation capabilities and barge shipping revenue. But breaching advocates say the lost hydroelectric power could be replaced by wind and solar energy. And loads that for years have been shipped by barge out of the Port of Lewiston will continue to move toward rail and truck. Also, the millions paid to mitigation efforts every year would not be necessary, and towns along the Snake River would see increased tourism dollars from anglers. A 2006 report from Save Our Wild Salmon concluded that over a 10-year period, the net cost for breaching would be $1 billion. Stahl said the only way to recover the fish is to remove the dams. "The logic is pretty simple; fish are born in the mountains, rear in the ocean, and they need to get back to the mountains to spawn and die and renew the circle of life," Stahl said. "We believe the government has failed in this regard." At the core of the argument is that the four dams produce relatively little power. The dams also are used to widen the channel for shipping barges. According to the Port of Lewiston, in recent years rail and truck transportation has become increasingly favored over barge shipping. In 2011, the port failed to hit the break-even mark. The following year saw a bump in containers leaving the port, but numbers have been falling since. Mike Edmondson, program manager for the Governor's Office of Species Conservation, said while those are all valid points, other factors must be considered. "Society made this decision already," Edmondson said. "It's not like they just went in overnight. We just can't be whimsical about whether or not we are going to stick with that decision." The state is abiding by the recovery plans, which do not see breaching dams as necessary, Edmondson said. While admitting dams affect fish numbers, he said they aren't the only impact, and more emphasis should be put on habitat restoration. "Let's just say for one second the dams aren't there. 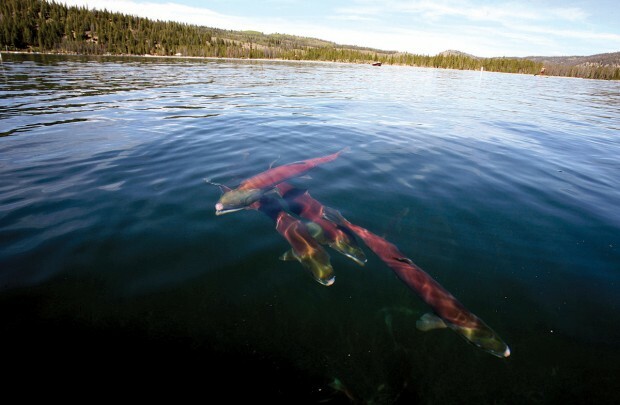 Would we have healthy fish populations in Idaho?" he said. "I would say probably not." But Bert Bowler, of Snake River Salmon Solutions, said the Middle Fork of the Salmon River represents a trump card against that argument. The cold, clear river cutting through Idaho's largest wilderness area is chock-full of ideal salmon and steelhead habitat. "It's as good of conditions as you can get," Bowler said. "If the stocks are going down in the Middle Fork, it tells you with what you are doing in the other streams is not going to make a hell of a lot of difference. It will take centuries to bring those runs back." Perhaps one of the biggest arguments against dam breaching is the "slippery slope" argument, which contends that if you take one dam down, you'll move to rip them all out. Bowler said it's a way for government to protect what he calls "federal pyramids." "I think it still gets back to those dams are so sacrosanct -- they are the pyramids," he said. "You don't even expect a conversation about removing the federal pyramids." On the Yankee Fork, work continues to mitigate the damage done by another man-made monstrosity. 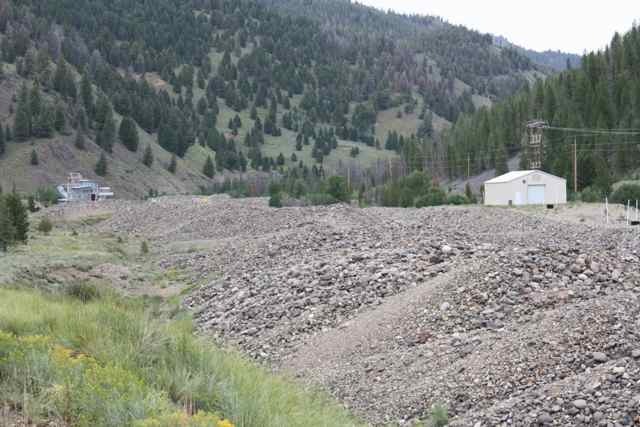 Dredge mining on the Yankee Fork, Green said, killed off the fish that spawned in the river. The fish now using the stream for spawning grounds come from nearby rivers and are not of the same genetic structure of the fish that historically started and ended their lives in the Yankee Fork. "The combination of the dredge and the dams, and all the other destruction that we've been able to do, it all adds up," Green said.